Norstar T7406E is a full-featured, multi-line telephone that allows mobile employees to stay in touch with the features and capabilities of their desktop. The T7406e ranges up to 1000 feet from the base station and supports 1-8 people, enabling employees to be more productive while moving about the office. It is ideal for small enterprises, branch offices, retail, healthcare clinics, manufacturing and other typical business environments. Business Series Terminal T7406 is a full-featured, multi-line cordless telephone for businesses that would benefit from a workplace mobility solution. It covers an area of up to 282,000 square feet and supports 1-6 people, enabling your employees to be more productive while moving about the office. It is ideal for small enterprises, branch offices, retails, medical offices, warehouses and manufacturing environments. 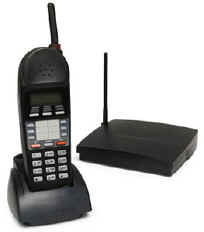 Nortel discontinued the Companion Phone line in 2002. However, we are often able to source new and used handsets and other Companion components for our clients. The Nortel 6120 WLAN wireless telephone is designed for the industrial environment with its push-to-talk capability eliminating the need for two-way radios appropriate for work groups that are dispersed throughout an environment. The larger earpiece provides comfort for the user and seals out background noise. The Nortel 6140 WLAN wireless telephone is engineered for demanding environments that require a higher level of workgroup collaboration, but is small enough to be highly mobile, yet rugged enough for heavy use. Utilizing its Open Application Interface (OAI) via the Nortel WLAN Application Gateway 2246, the handset can function as a two-way messaging device allowing integration with other enterprise systems to provide mobile workers with access to critical information.